Watching skies is a favourite past time - no matter where I am! Here are some from this past week - maybe spring will arrive soon! We woke to snow this morning! Be sure to visit the great sky watchers here. A great giveaway and interview! Just a quick message to let you know about a great giveaway - of a course by Christy Tomlinson on journaling and an interview with her. Be sure to visit the blog by the 30th! Be sure to check out the great shadow-chasers at Hey Harriet! Time to share skies - and after a week of glorious sunrises in Myrtle Beach last week I have a few to share! And that blue sky was so lovely to see almost every day! 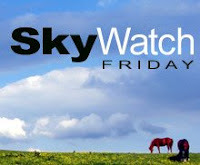 Be sure to check out those wonderful skywatchers here. How do you wish to sparkle? If ever there was a woman who sparkled it was Liz Taylor. She was legendary and so full of life. 1. (v.i.) sparkle to shine or glisten with little gleams of light, as a brilliant gem; glitter. 2. sparkle to be brilliant, lively, or vivacious. Again - this made me think of Elizabeth Taylor! "Enthusiasm is the sparkle in your eyes, the swing in your gait. The grip of your hand, the irresistible surge of will and energy to execute your ideas." I am tired of being tired, of being quiet, of being sluggish and careful. I need to add sparkle to my life; to be more lively and gutsy. I need more enthusiasm, and a surge of energy! I need to find a passion and take it on fully. Life is to be lived, not just endured! Jamie of Jamie Ridler Studios encourages us to "be a maker of magic and a tender of wishes. It’s easy. Answer the wish prompt above on your blog . Support wishes by visiting other participants. It’s that simple. There is great power in wishing together. Let the magic begin!" Be sure to visit the great wishcasters here. Here's wishing everyone a wonderful weekend and week. March Break starts tomorrow and we are off for a welcome rest! I am going to take a break from blogging as well! When I return I want to celebrate my 2nd year blogversary (March 17), as well as my 500th post! There may even be a giveaway!! Be sure to visit Hey Harriet other great shadows, a fun meme created by Tracy.